I’ve been using Dove Beauty Bar Pink/Rosa to protect my skin from the perils of winter. I chose to buy this beauty bar after my friend raved about its virtues and since I had already used their Dove Gentle Exfoliating Body Wash before and loved the way it left my skin feeling exfoliated, soft and smooth, I decided that I should also try this particular Dove product. Further it was also mentioned on the cover that it contains a good amount (one fourths) of moisturizing lotion and doesn’t dry the skin like any ordinary soap, also Dove soaps are known to be pH neutral and non-alkaline; so without much ado I purchased it. 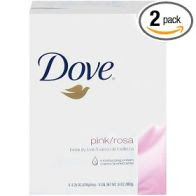 Besides as I love the color ‘pink’, pink/rosa seemed a better choice compared to the other white Dove beauty bar. And I must say that Dove Pink/Rosa hasn’t let me down. It is one of the best all-in-one cleansers that I've ever used. It leaves every inch of skin clean, smooth, and moisturized. It’s great for acne-prone skin too, though I happened to read somewhere in a forum that it isn’t particularly good for acne. At least for my acne-prone skin, it didn’t cause any untoward flare-ups; as a matter of fact, this soap with its gentle fragrance and a shape that makes it easy to hold in the shower without slipping from the hands, left my skin clean, smooth, hydrated and lightly scented. No doubt all Dove products are a tad expensive, but this one’s really good and is worth the value for money. Overall, I can say that it’s a wonderful product and a great cleanser which leaves your skin feeling soft, supple, nourished and well-looked after. Highly recommended during winter and in other seasons as well. hi,great blog here.Frankly,this is the only blog on the net where I see reviews of products available in the Indian market ! would love to see more reviews on cosmetic lines like Lakme,aroma magic etc .. I love Dove Products. I use the Dove soap for sensitive skin daily. I also use the Dove facial cleansing cloths. They are the best! They do not dry out your skin. Great review! I think I’m going to have to pick up this soap. This is MY favorite one. I really like that it has a fourth of moisturizers in it. I like the fact that it is fragrance-free. It does n t have any chemical dyes or any chemical fragrances in it. It is hypoallergenic. And it is a really nice moisture I have very dry sensitive skin. This did not dry my skin out which most bar soaps do. When I don t normally like using bar soaps this is probably the only bar soap that I use when I do. And I really like the fact that it doesn t have a scent and so does my husband because he doesn t like the perfume-y stuff that he has used in the past. So this is called Dove Sensitive Skin Fragrance-Free Beauty Bar. And it is a really good offer that a soap that I recommend. Thanks for the post. Have you heard of the Cosmetic Database? http://cosmeticdatabase.com When checking Dove soap, you will notice it has a hazard score of 4 out of 10. There are better choices. We need to be aware of what we are putting on our skin. I would like to introduce you to Glimpse Intuitive Skin Care. It's clean, green, holistic, unisex and contains NO Toxic chemicals. To your ultimate health in 2009!! @sangi.krish, thanks for the nice words about my blog. Will definitely review the products that you have mentioned. Keep dropping by and leaving your valuable feedback and suggestions. You'll bankrupt me...I want to try everything you recommend -- and often do! Thanks for sharing this! I am always on the look out for new products. Make it moist. Rub gently to make foam and apply the foam on your face and wash.